EnerFlow™ 20 is a Completely New Additive Package for Bulk Treatment of blended Biodiesel’s between B1 and B50. Proprietary Formulation based on proven technologies. Twin technologies treat both biofuel and petro-diesel components of biodiesel. Provides Excellent Cold Weather Protection for Both Components (Petro-Diesel and Bio-Diesel) of blended Biodiesel. Provides significant CFPP improvement, lowering it between 15F and 30F. Provides dramatically increased stability for Biodiesel. Slows oxidation and breakdown of blended biofuels. Draws out and disperses water held in the fuel. 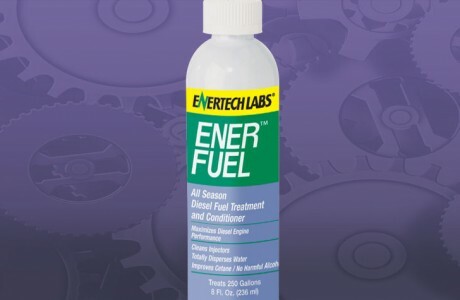 Inhibits bacterial and fungal growth in Biodiesel without use of pesticides.”A” Rated Corrosion Inhibitor to Reduce Engine and Storage Tank Corrosion.Reduces or eliminates formation of Gums, Varnishes, and Carbon in the fuel system. Dramatically Slows Sludge Formation in Engine Oil. EnerFlow 20 will disperse (eliminate) up to 1/6 of its own volume of water. EnerFlow 20 should be stored above 40°F. 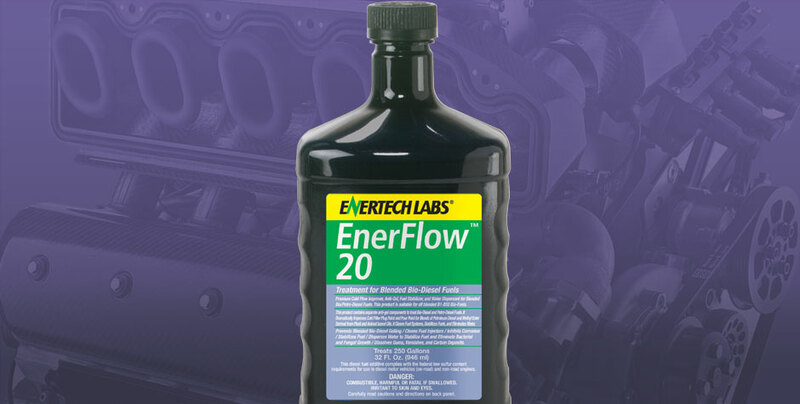 EnerFlow 20 should be mixed with blended biodiesel between 60°F and 140°F. Blending with fuel at temperatures below 60°F may result in poor or incomplete mixing and performance less than described. Storage and Blending:Needs to be stored above 40°F. If stored below 40°F, allow product to warm up to least 60°F before use. Blending should take place with B1 – B50 (includes B2, B5, B10, B20, etc.) fuel at or above 60°F. NOTE: (Blending below 60°F may result in incomplete blending, performance less than described, and or possible product separation). Enertech Labs, Inc. provides no warranty of any kind with respect to the product whether express or implied including without limitation, the implied warranty of merchantability or fitness for any intended use or purpose; shall not be liable under any circumstances for any loss, damage, liability, injury or expense directly or indirectly resulting from, arising or related to the use or application of product; shall not be liable for consequential or incidental damages or loss of profits; and its liability shall be limited to replacement of the product.